Just because I’m bigger than the average bunny doesn’t mean I don’t get scared. Something is following me. Every time I hop to the left, it moves left. When I hop to the right, it moves right. Now I can see its shiny eyes. And then with a rustle and a soft thud it lands in front of me. It gives me quite a fright. I drop the basket I’m carrying and the eggs and chocolate go flying like confetti. I land on my tail, which cushions my fall. Standing in front of me is a kitten. “What are you doing?” the cat says. “I’m delivering Easter treats,” I say as I gather up the spilled confections. “You’re a big bunny,” the cat says. “What’s an Easter Bunny?” the kitten asks. I reach down and scoop up the kitten. In a flash of blue light we’re inside the house. On a table are two baskets. I put the sugary bounty in them. I look over to see the kitten trying to pull a piece of paper grass out of the basket with his teeth. I give him an angry look. We continue to travel from house to house and I do my Easterly duty. Finally, we’ve reached the last house. The kitten is very tired. I begin to fill the first of three baskets, and when I get to the last one I find the kitten curled up inside it. Now I’m not in the business of delivering kittens on Easter morning, but I know that this family lost their beloved cat Mr. Paws a couple of months ago, and this kitten not only needs a home but it also needs a name. I leave the sleeping kitten. If you’re wondering what happened to the kitten, I’m pleased to say that Jellybean, as he is now known, is very happy living in a cozy house with his loving family. I visit him every year at Easter. Sometimes he comes with me when I deliver baskets of eggs and chocolate treats. Jellybean is as sweet as his name. He is my Easter Cat friend. Turtles get around. They can swim. Some can climb. But turtles can’t jump or hurdle. Why can’t turtles hurdle? It’s the way their legs and muscles attach to their bodies. A turtle’s legs do not move back and forth or up and down like your arms and legs. Turtles don’t have the muscles that allow them to move like you can. Turtles walk slowly. Their legs are short. They cover only a little ground with each step. Turtles don’t have feet like you. Their front feet are shaped like paddles, designed more for swimming than for walking. In water, turtles can float or swim. To move around, they paddle with their legs and tail. In the water, their legs don’t have to hold their body weight, so they’re free to move. Their legs and tail propel them through the water. The tail is used to steer. How is a Turtle Built? A turtle’s skeleton is different from any other animal, including man. The turtle’s shoulder blade is inside the rib cage and the ribs are part of the shell. Bones make up the entire skeletal system in turtles. Their connective tissue mineralizes into bone shortly after hatching. This means their legs, necks and spines aren’t as flexible as yours. The turtle skeleton is divided into two main sections, the ectoskeleton and the endoskeleton. The ectoskeleton of a turtle is its shell. The endoskeleton consists of all the internal bones. The turtle’s shell is part of its bone structure. The shell is more than an outer covering. It’s part of a turtle’s body. During the turtle’s early life inside the egg, when its skeleton is forming, the shoulder blade and the ribs become part of the shell. On the underside of the turtle is a softer shell called the plastron (plăstron). So could the turtle lose its shell? No. It would kill the turtle much the same as if you tried to live without your back bone. The endoskeleton is inside the body. Your spine and all of your bones are inside your body, covered by muscles and skin. You have an endoskeleton. The turtle’s endoskeleton is divided into two sections. The first is called the axial skeleton. It is made up of is made up of the skull and both the cervical and thoracic vertebrae. The second section is called the appendicular skeleton. The appendicular skeleton includes the rest of the bones. In the axial skeleton, the skull protects the brain. The skull is made up of several bones combined to make a protective case. The neck bones are the cervical vertebrae. Most turtles have eight of these bones. The thoracic vertebrae are fused to the carapace plates. The carapace is the hard covering on the back of the turtle. The ribs branch off from the inside of the carapace. There are usually ten ribs. You can compare this system to your rib cage. Your ribs connect to your thoracic vertebrae, which is the upper part of your spine. In the appendicular skeleton, the limbs are designed especially for swimming. The front limbs work like paddles and the back limbs are used mainly for steering. Think about how you use your arms and legs for swimming. This is why the turtle is more at home in the water than on land. The turtle is built to swim. It swims to catch food in streams. The turtle is built to climb. It climbs to rest on a rocks. Indeed, turtles get around. But can you name one thing a turtle can't do? A turtle can’t jump. No, the turtle can’t hurdle. Bear is trying to tell a story. Bear’s friends don’t have time to listen to his story because they are busy preparing for the approaching cold season. In this quiet book, the reader learns about how Mouse, Duck, Frog, and Mole survive the winter, as well as Bear. The charming, wispy pictures convey the sweet tone of the book making it easy to fall in love with Bear and his companions. The portrayal of Bear’s relationship with the other animals is exactly the kind of world children want to believe in and maybe some adults, too. 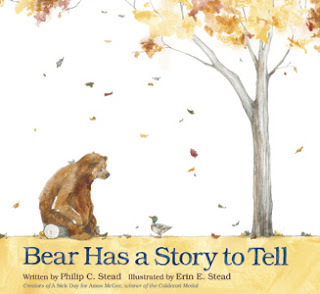 The book is written by Phillip C. Stead and illustrated by Erin E. Stead. They are a husband and wife team who are both authors and illustrators. They won the Caldecott Medal for their book A Sick Day for Amos McGee.